During my regular life (meaning, not living in Rome on a semester abroad), I overburden myself. I thrive when I am over-committed, so I work multiple jobs on top of being a full-time student. So I told myself that going abroad would be time for me, and I would focus on relaxing and just having fun. This is important context for what comes next. The Career Center at John Cabot University in Rome sends internship opportunities by email every few days. One of the opportunities they shared caught my eye: “For international contemporary art/photography/street art publisher: correct, edit, write pieces like press releases, book descriptions, social media, and website.” Repeating myself, I did not want to work during my semester abroad. But the habits of an workaholic are too strong in me. So with low expectations (and not even knowing if I wanted this internship), I sent in my resume. In less than 12 hours, the executive director of Drago Publishing called me directly to schedule an interview. Thursday at 12:30pm, only in my third week in Rome, I sat down for an interview with an Italian publishing company. Domitilla, the executive director, was concise describing what she was looking for, and told me that my resume and experience looked perfect. Instead of asking me why I applied for the job or what my strengths and weaknesses were, Domitilla said she could much better see if I was a good fit by viewing me in action. In a blur of English with Italian sprinkled in, she explained my work for the afternoon: research some advertising options for two new books, rewrite some copy on the company’s webpage, and compile information for a call she would be having later that day. A bit overwhelmed but up for the challenge, I settled into work. Before I got too far, though, Domitilla asked me if I had eaten lunch yet (I hadn’t, since I had rushed to the interview from class). She introduced me to Ninja (a nickname used far more often than his real name, Paolo), another employee of the company, and gave him money to buy lunch for the two of us. Ninja’s English was not excellent, but nevertheless I loved talking with him and eating pizza at Piazza del Popolo before heading back to the office. That’s when I really began to work. Domitilla was in meetings until 5:30pm, when she asked to see what I had come up with. I showed her the consolidated options for advertising with one of Drago’s distributors, and a list of questions to ask their advertising representative during her 6:00pm call. After reading through the questions I had listed, she exclaimed, “This is fantastic. I want you on. You’re going to be on this call with me.” Wondering what I had gotten myself into, I sat down with Domitilla to prepare for the conference call. After she spoke with the distributor for a few minutes on another issue, she passed the phone to me and told me to go for it. In a sink or swim moment, I wouldn’t say I was an Olympic swimmer, but I was definitely above the doggy-paddle level. Essentially faking it ‘til I made it, I directed the remainder of the call with my questions about the advertising options. When the call ended, Domitilla asked me to come back the next day. She said the internship would be paid, and gave me one of her old bikes so I could get around the city easier. I biked home past Saint Peter’s Basilica in the fading light, and wondered to myself if any of the past 6 hours had really happened. But it did happen, and I returned the next morning to continue working. 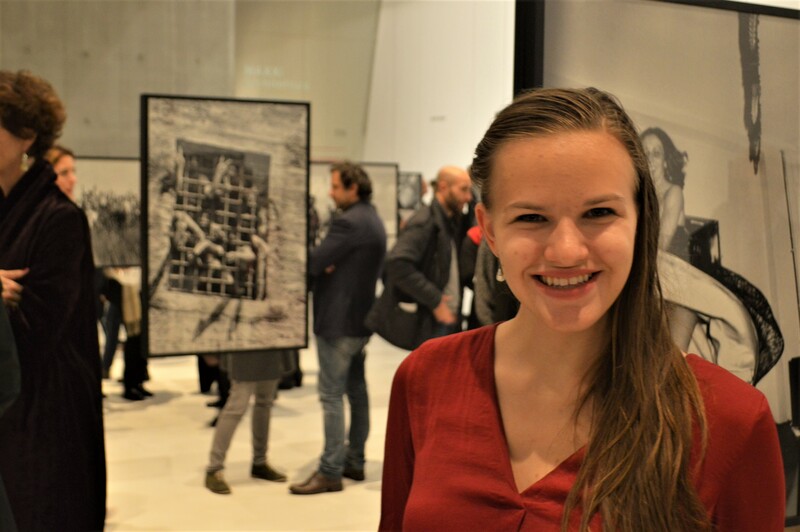 As part of my internship in Rome, I attended the opening of a contemporary photographer’s exhibition. My internship with Drago was one of the most valuable parts of my semester abroad. Especially rewarding was working on the release of Just for Passion, the newest book of contemporary photography for the publishing house. In November, nearing the end of my time in Rome, I attended the VIP gallery opening of Letizia Battaglia’s Just for Passion exhibit at the MAXXI Museum of Contemporary Art. Seeing the printed book for the first time, I noticed a small detail in the back of the book which made my heart leap: my name was published in the book. 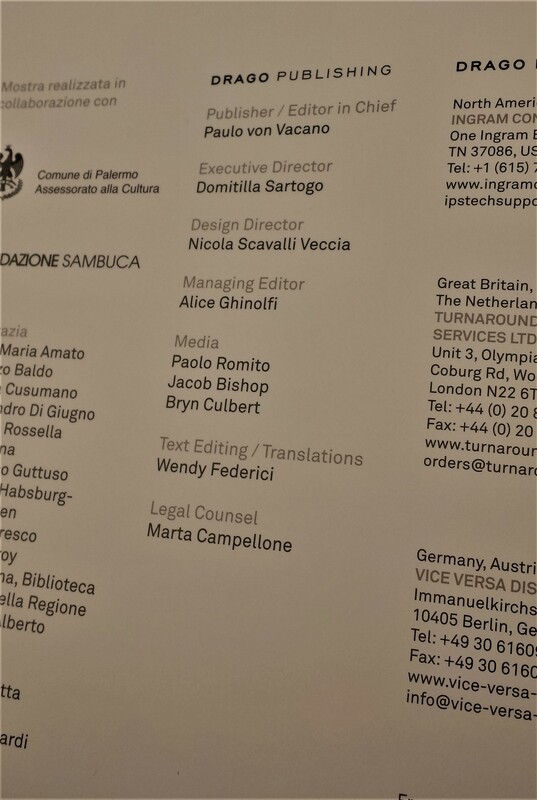 If I accomplish nothing else in my life, at least I can say that I contributed to the media and marketing of a contemporary photography book by an Italian mafia photographer. Who else can say that? Note “Bryn Culbert” listed under Drago Publishing’s Media – I’m published!